These two things are always striving to stay in balance. Can one try to influence the other? Of course, and as they do their side of the scale goes up. But the other side will “fight” to retain equilibrium. This explains why it is so incredibly difficult to change a culture, as well as why it’s so painful to introduce into a culture a leader who doesn’t “fit.” That leader will push, and the culture will push back. These two things are always trying to stay balanced on the scale. Let’s say we are trying to bring change to an organization. We bring in someone, an insider or outsider, a change agent, a consultant or a coach, to try to do this. The only way for them to be able to actually make sustainable growth happen is by focusing on both sides of the scale. It’s not enough to focus just on improving individual leaders — the old culture will eventually push them out. Likewise, it’s not enough to focus solely on group behaviors, the culture, because they don’t exist without the individual people that make them function. Over time, the entire scale must be raised. 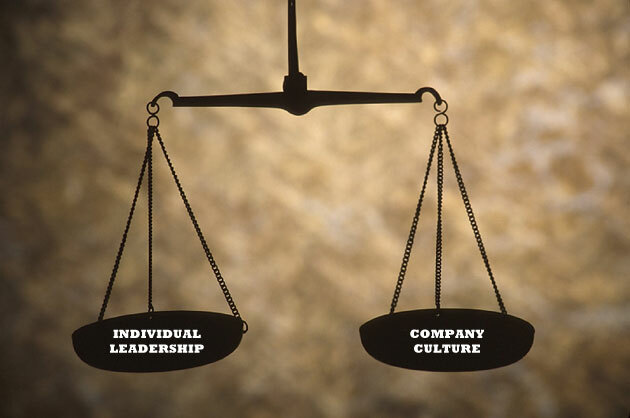 What’s going on behind the scenes, what we don’t see, is that the interactions between individual leaders and the larger group culture will always push the entire scale into motion, either going up or going down. There is no such thing as a plateau in an organization — it is always moving one direction or the other. Getting better or getting worse. Improving or deteriorating. Evolving or regressing. That’s why Option C is the magic, focusing on the both/and of the scale, not the either/or. Yes, focus on the individual leaders. Make sure they are in the right spots and for goodness sake, get the wrong people off the bus. But also focus on the system, the culture, the groupthink, which is really just a collection of a million tiny decisions the individuals make. If we want it to last, it has to be both/and. You and Ken never cease to amaze me! I was viewing his blog and I thought I’d view yours. Incredible similarity. It’s like I have twin sons. This is why we relate to each other so well. Hang in there…you are growing and that’s what counts.